The central objective of database marketing is to build a bond between your company and your customers that results in increased loyalty and expanded sales. You are trying to recreate the bond that existed between the old corner grocer and his customers: he knew them and greeted them by name when they came in to shop. He did favors for them. He carried heavy packages out to their cars. He was a family friend. As a result, his customers were loyal. They bought all their groceries from him. Today with tens or hundreds of thousands of customers, we cannot do the same thing. But, due to the growing sophistication and reduction in cost of modern computers, we can come close to duplicating the corner grocer’s methods. Using a modern database, you will keep information in your database about your customers, their families, their preferences, their purchases. Why keep such information? So that you can develop a relationship with the customers that they will appreciate and value. You want to give them recognition, personal services, special attention. The database is used, not to target your marketing (which is 1980’s thinking), but to develop what Don Peppers calls a 1:1 relationship. Before you spend a lot of money creating a customer database, you have to decide what you are going to do with it. Collecting names and purchase history is really the easy part. The hard part is thinking up what you can do for your customers, with the database, that the customers find valuable to them. Say to yourself, “Why would I want to be on that database? What’s in it for me?” If you can’t think up a good answer to that question, your database project will fail, and you should not waste money on it. 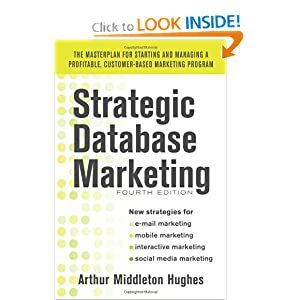 There are tens of thousands of products and services for which database marketing will not work: it won’t increase sales sufficiently to pay for its cost. Your goal, therefore, is to come up with a great idea for building a customer relationship that will be valued and appreciated by the customers, and will be cost effective for you. It may be a gold card, a newsletter, preferred customer benefits, air miles, points, birthday awards — something that your customers will find attractive and which won’t cost you too much. Since everyone else today is thinking up similar programs, you will have to work hard to make yours stand out. One way is to discriminate between your best customers, your next best customers, and your average or poor customers. Discrimination is essential. If you treat all customers alike, you won’t be able to afford to give very valuable benefits. I suggest that you use RFM analysis to separate your customers into quintiles. The top quintile are your best customers. You want to devote your service dollars to this group. Give them royal treatment. Let them know it, and let the others who are not eligible, what they are missing. The next lower quintile is where you should spend your marketing dollars. These customers are your hope for the future. You want them to be constantly trying to achieve gold status. As for the balance of your customers, I would advise that you ignore them, for now. Concentrate your attention and your service and marketing dollars on the top two quintiles. Do a super job of building loyalty and increasing sales. Once you have gained experience with these valuable customers, you can have the leisure to work on the less profitable customer groups. How can you determine whether the strategy you have selected will be successful? There have been a great many failures in database marketing. There is a method for knowing, in advance, whether your customer loyalty building strategy is likely to succeed. That method is Lifetime Value Analysis. You build a lifetime value table for your current customers, and then build a second one, assuming the adoption of your proposed strategy. All such strategies have benefits (increased retention, referrals, and sales) and costs (from the communications, the data processing, the awards and services). Analyzing the two tables will show you whether lifetime value will go up (a good strategy), or down (scrap it — it won’t generate profits). 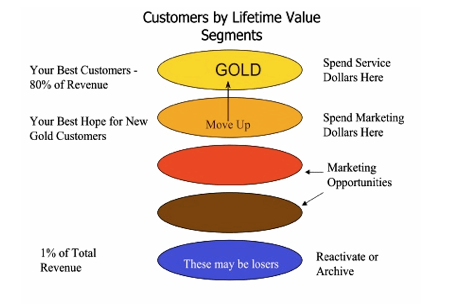 The details of lifetime value theory and practice are spelled out in Strategic Database Marketing, published by McGraw Hill.